The Oculus K5 keratograph is an invaluable tool for the assessment, diagnosis and classification of dry eye. Amongst the properties this versatile device measures are tear volume, tear film break up time, lipid layer assessment, tear flow dynamics, conjunctival redness scan and infrared meibography to visualise the structure of the meibomian glands under infrared light. All these procedures are non-invasive and involve little if any discomfort. The keratograph's software also provides an analysis of responses to the Ocular Surface Disease Index (OSDI) questionaire as well as a summary of the tear properties measured. These results help substantially in determining whether eye disease is evaporative, or due to aqueous insufficiency, or a mixture of both. 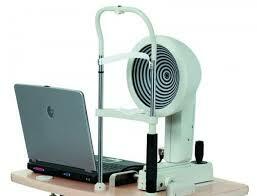 More on how the keratograph assists in diagnosis can be found in assessment and diagnosis of dry eye.